1 bunch of coriander, ½ bunch of dill and ½ bunch of mint. Wash white potatoes, tomatoes and herbs. For this dish, you will need thin-skinned white potatoes, which you don’t need to peel, just a good scrubbing with a knife will remove the skin. Using a multifunctional potato peeler with the pointed end potato corer (alternatively you can use potato corer) scoop out the flesh from potato. To do that you need to place peeler’s tip on the top edge of the potato and twist in gently. Slowly push the peeler in further as you continue to twist. Then scrape out the inside flesh of the potato. Be careful not to go too deep, otherwise, you will cut your potato through the other end. 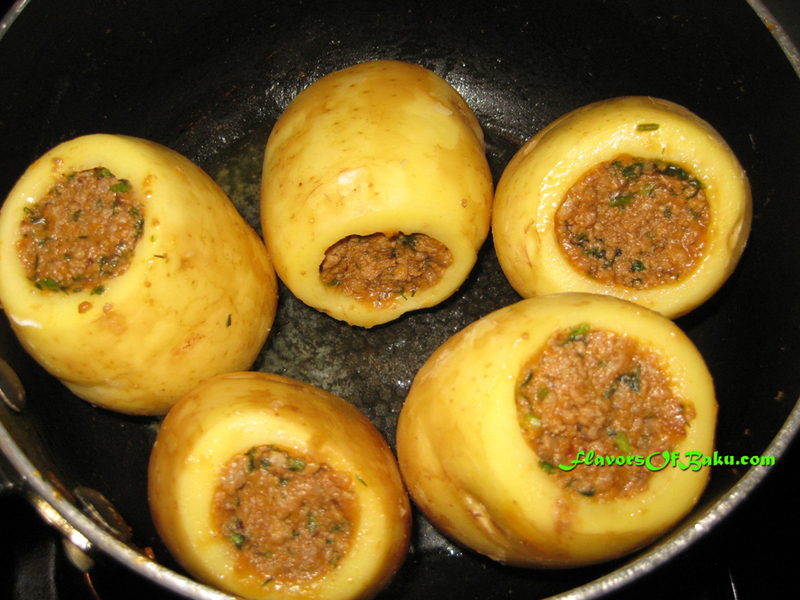 The edges have to be not too thick and not too thin, so that you can stuff your potato with a decent amount of meat. Cover tomatoes with boiling water. Leave them in the water for one minute. When the skin starts cracking, remove tomatoes from the water with the spoon and place in a bowl of ice-cold water. Let them chill for a minute, then peel their skin off, and chop them. 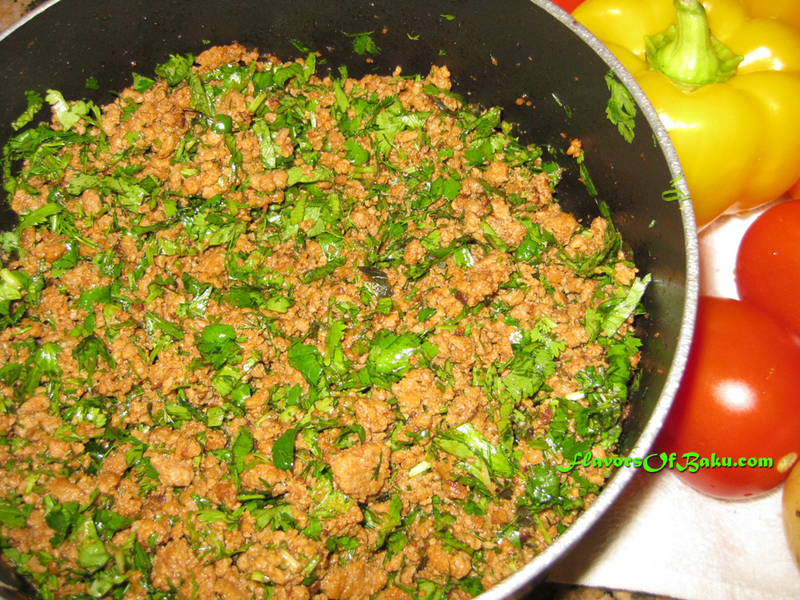 Mix the ground beef (or lamb) with finely chopped or ground onion. Cook the stuffing in a large pot or skillet over medium heat. Stir continuously until it is well done. 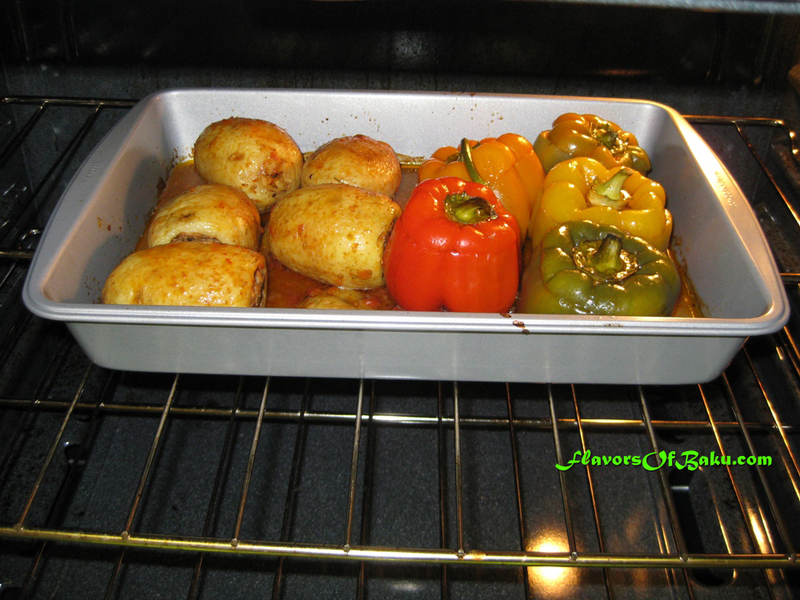 When the meat is done cooking, add salt, pepper, chopped herbs, and half of the tomato flesh and mix well. Add butter if needed. Remove the stuffing from the heat and let it cool. Fill the potatoes with the stuffing and fry them in hot clarified butter on both sides until golden brown. Place the potatoes side by side in a deep baking pan, and pour the remainder of the chopped tomato flesh and butter around them. 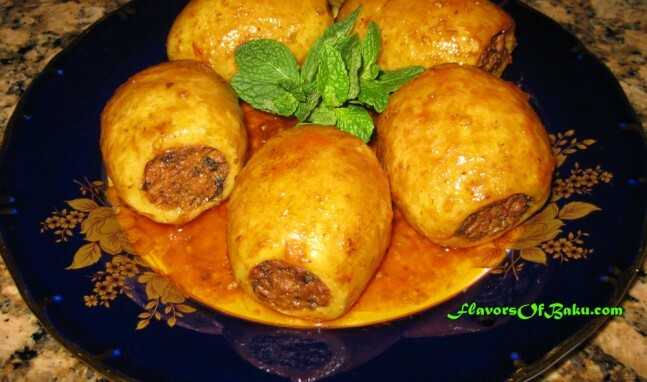 Preheat the oven to 300°F (150°С) and bake the dolma until all the potatoes are tender. Serve Kartof Dolmasi with a yogurt-garlic sauce.